There’s a constant dialogue about whether or not food is art, and that’s a conversation that has no clear-cut resolution. However, one thing’s for sure. 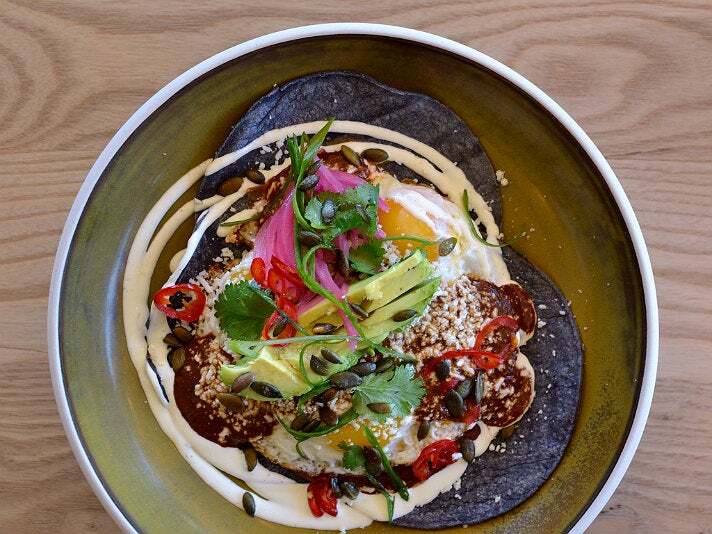 People who experience art in museums need sustenance before or after their excursions, so we've rounded up 22 great dining options near museums across Los Angeles. 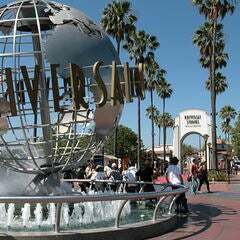 USC is at the nexus of some of L.A.’s top cultural institutions at Exposition Park, including the Natural History Museum, California Science Center and the California African American Museum. 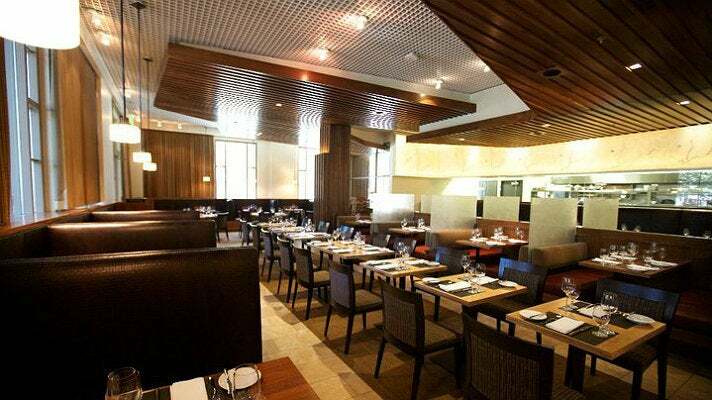 The top restaurant on campus is undoubtedly Moreton Fig, which resides due south of the famed statue of Tommy Trojan. The contemporary restaurant and lounge houses a patio with lime green umbrellas and a towering fig tree. Inside, the space touts curvy wood lines, a glass fronted kitchen, sumptuous banquettes and booths. Chef Tim McDowell’s weekday-only menu changes seasonally and might include SoCal shrimp and grits with pico de gallo and jalapeno aioli; ahi poke with sesame wonton crisps and soy ginger sauce; and pappardelle with caramelized winter sauce, mascarpone and pomegranate seeds. Restaurants are rarely as high profile as Otium, the grand destination from vaunted chef Timothy Hollingsworth that opened alongside The Broad Museum on Downtown L.A.’s Bunker Hill. Office towers rise above Otium, but the space still feels welcoming, with a spacious patio that fronts a lawn and a modern design with warming wood elements and an open kitchen. Hollingsworth is rooted in fine dining, which is evident in plating and sourcing, but he’s a chef who can still have some fun. 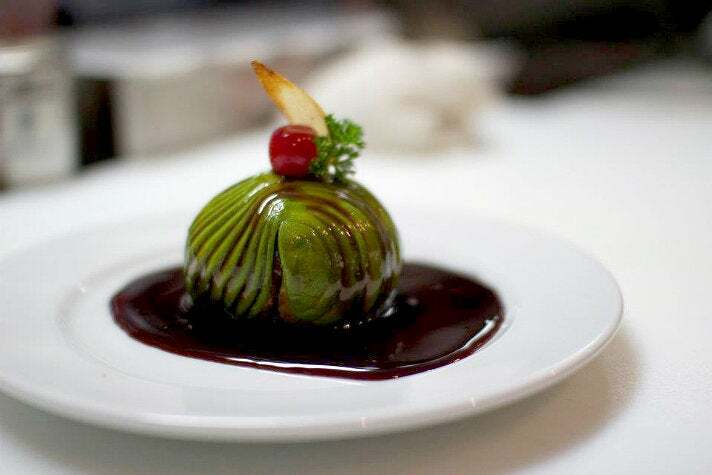 Funnel cake, normally fair food, comes dressed with dollops of rich foie gras mousse, tangy balsamic reduction, sweet strawberries, and enlightening fennel (stalks and fronds). Hangtown fry riffs on the popular California gold miner dish from the 19th century, in this case an omelette with bacon, Parmesan mousse, chive blossoms, and fried oysters. Otium even has a tantalizing off-menu dish, smoked French toast nuggets with pork belly, maple cream, black truffle berry jam, and decorative beet leaves. Their untraditional Bloody Mary combines vodka, smoked tomatoes, clam juice, and pork fat. 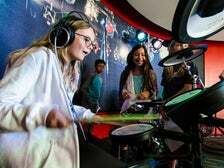 You’ll find Ford’s Filling Station right around the corner from the music-focused Grammy Museum at L.A. LIVE. This second generation gastropub from Chef Ben Ford is on another level from Ford’s former location in Culver City. Ford serves three meals daily at the glass-fronted restaurant that resides on the ground floor of the JW Marriott hotel.. Popular options include the Fat Jack bacon burger with Jack cheese, avocado, griddled onion, pickles, tomatoes, and “not-so-secret sauce” on a brioche bun. 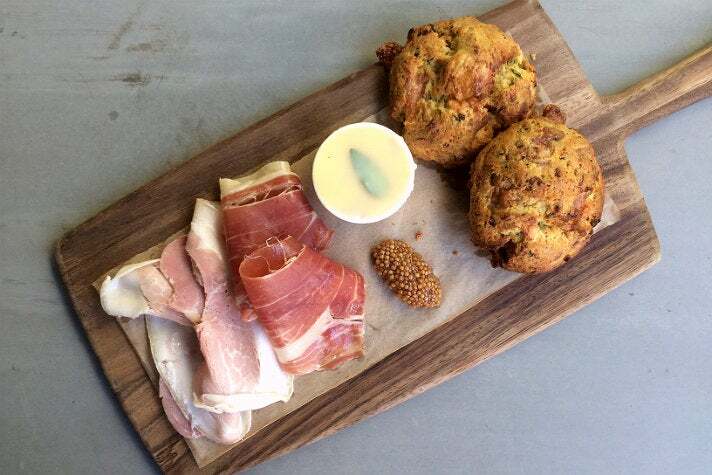 The Ham N’ Biscuit Board is also a hit, featuring Texas ham, potted ham sealed with pork fat, clarified butter and sage, and buttery white cheddar bacon biscuits flecked with scallions. 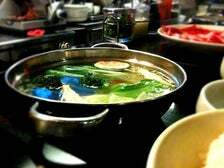 Try to get to Shabu Shabu House early, because this Little Tokyo mainstay tends to get mobbed at lunch. Masako Maruyama presides over his horseshoe shaped counter and leaves very few decisions to his customers. 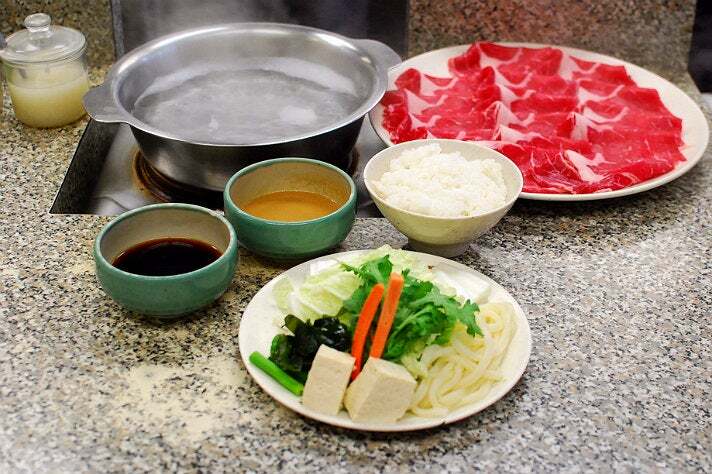 Choose how much sliced-to-order ribeye to drop into boiling water and dip in either ponzu or sesame sauces. An A Set yields 10 slices, and the B Set brings 15, which is plenty, especially when combined with cabbage, seaweed, tofu and udon. 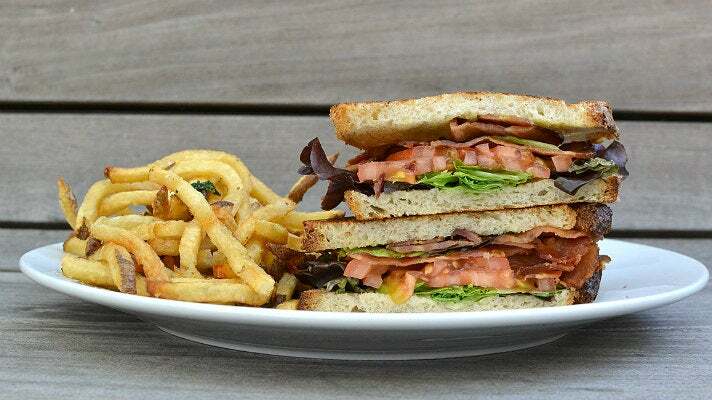 Blue Cow Kitchen, a more ambitious spinoff of Mario Del Pero and Ellen Chen’s successful Mendocino Farms sandwich concept serves as the company’s idea lab while riffing on seasonal American classics. 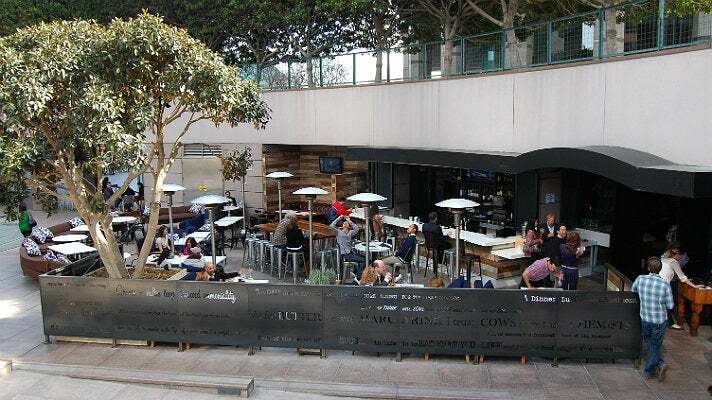 Located at California Plaza just steps from the Museum of Contemporary Art (MOCA), the space features a funky patio with mismatched tables, an indoor-outdoor bar, and an interior with an open kitchen, full-sized blue cow statuette and a light-up sign that encourages diners to EAT HAPPY. Mission accomplished with dishes like chicken wings with aji Amarillo sauce, maple pork belly tacos, and a mammoth Royale with Cheese. 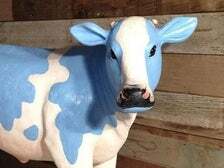 Blue Cow has put thought into their cocktails, with a Not-So-Old Fashioned and Rum Manhattan on tap. 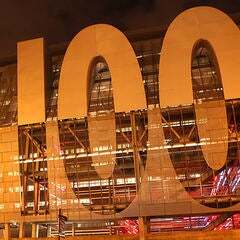 Just a few blocks from this celebrity-minded museum, which displays show biz memorabilia, you’ll find a fully realized branch of Jimmy Shaw’s Mexican restaurant, Loteria Grill. The space features the eponymous playing cards that depict cacti, the moon and a heart, along with potted trees and windows that provide views of always-kooky Hollywood action. 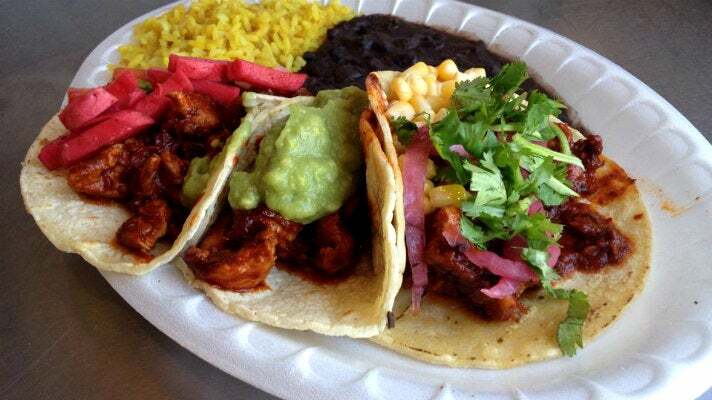 Sure, Loteria’s got tacos, and this branch also serves plates like sea bass pan-seared in chile morita sauce, char-grilled skirt steak, and cocktails that center on tequila and mezcal. The Craft & Folk Art Museum has been located on Miracle Mile’s Museum Row since 1965. 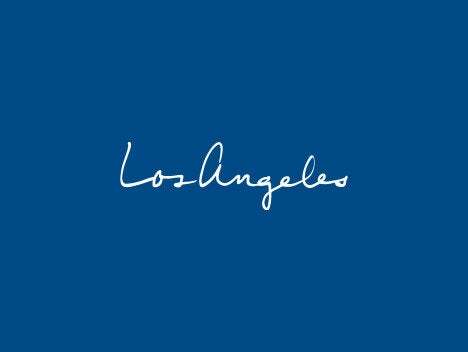 The La Brea Tar Pits and the George C. Page Museum have been across the street since 1975, and now both institutions are within walking distance from several Wilshire Boulevard restaurants. Slow Fish is a sushi bar with shimmering silver and red walls, dark furniture and elaborate chandeliers. 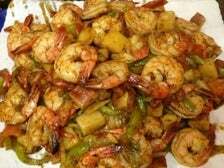 The menu is on the large size, though most people favor seafood and black rice sushi over salads and vegetable dishes. Popular selections include Fat Avo, with seasoned albacore blanketed with avocado and eel sauce; and black snapper dressed with yuzu kosho, shiso, lemon juice, olive oil and sea salt. Patina Restaurant Group and architect Renzo Piano took the Los Angeles County Museum of Art (LACMA) hurtling forward with Ray’s and Stark Bar, which opened across the courtyard from Chris Burden’s Urban Light installation. Ray’s pays tribute to producer Ray Stark, who brought us films like Funny Girl and Steel Magnolias. 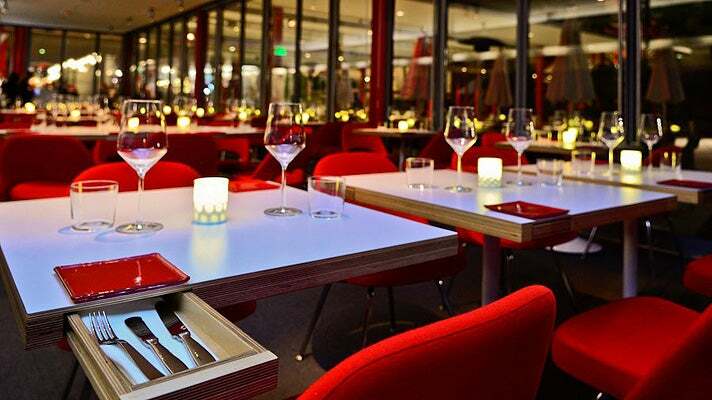 The restaurant has an open-air bar and sprawling red lounge seating that’s popular during happy hour. Helmed by Executive Chef Ferndando Darin (previously chef de cuisine at the Hollywood Bowl), the seasonal fare showcases Neapolitan-style pizza, housemade pastas, salads made with the freshest ingredients from the restaurant's own garden, and small plates to share. The Los Angeles Museum of the Holocaust at Pan Pacific Park spotlights a dark time in human history. Before or after the experience, take a short walk to The Original Farmers Market, open since 1934 and one of L.A.’s most popular attractions. 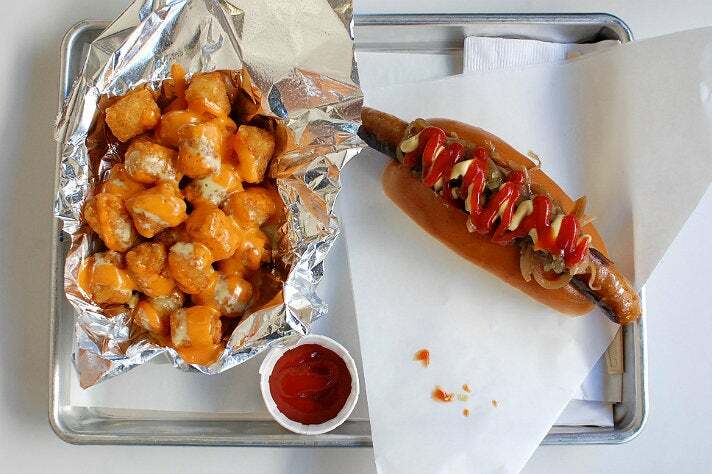 Fritzi Dog is a fast casual option from Chef Neal Fraser and partners that features a number of different sausages and hot dogs in an open-air setting. 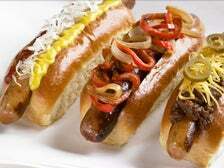 Options include Bird on a Wire, a “bird dog” with grilled peppers, onions and sweet mustard, and the Tokyo Dog, featuring a “porker dog” with wasabi aioli, peas, Sriracha ketchup and nori. 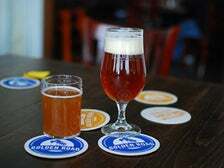 Golden Road Brewing is located across the L.A. River from Griffith Park, the Autry National Center and the Los Angeles Zoo & Botanical Gardens. The sprawling campus features buildings of three different colors – red, blue and yellow – and The Pub at Golden Road occupies the southernmost yellow building. The space features an elevated patio and dining area, with a surrounding Astroturf lawn that sometimes hosts yoga classes. The Pub rotates 20 house beers, including core brews like 329 Lager, Seasonal Custom IPAs and specialty beers, some of which raise money for charity. Executive Chef Adam Levoe presides over a beer-friendly comfort food menu, including sandwiches, salads and snacks like fried avocado tacos. This sprawling hilltop museum from architect Richard Meier feels a world (and a tram-ride) away from Los Angeles and the madness of Interstate 405, which resides just below the Getty Center’s pristine, marble-fortified perch. A campus this well-funded of course has spectacular views, and naturally has plenty of food and beverage options, including a self-service Café with soups, salads and sandwiches; a Garden Terrace Café, and the most elaborate dining option of all, The Restaurant. This full-service option provides prized views of the Santa Monica Mountains. Executive Chef Mayet Cristobal features local, sustainable ingredients in composed plates like sea scallops with curried carrots, roasted sunchokes, celery salt mustard glazed pork belly and pickled shallots. The visually arresting Annenberg Space for Photography in Century City is located down the street from Craft, a restaurant from New York based chef Tom Colicchio that impresses in its own way. Chef de Cuisine Ray England and pastry chef Shannon Swindle tag team a seasonal mix-and-match menu in a classy setting with impeccable service. Farmers and friends who grow ingredients get prime real estate on the menu, which changes frequently. Recent dishes include spaghetti with Tasso ham and sweet peppers, four varieties of roasted mushrooms and honey lebneh cheesecake. Skirball Cultural Center is a modern Jewish museum that rests at the ridge between the San Fernando Valley and the rest of L.A., slightly closer to Ventura Boulevard than Brentwood. 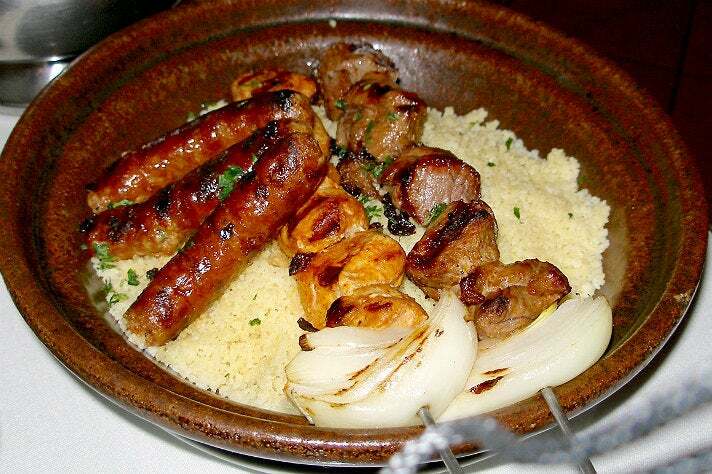 Just south of Ventura on Sepulveda Boulevard, you’ll find a strip of international restaurants that includes Simon’s Café, a Mediterranean restaurant from Chef Simon Elmaleh which pairs well with the Skirball. 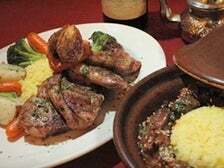 The menu stars an array of flavorful dips, tagines featuring lamb or chicken with dried fruits, and pastilla, a ground chicken and duck pie wrapped in pastry and dusted with cinnamon sugar. The Fowler Museum is a showcase for global arts and cultures that resides in the center of UCLA. On campus, Ackerman Union houses the largest dining selection. 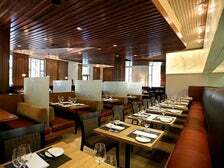 On Level 1, Wolfgang Puck Express features several signature dishes from the famed Austrian-American chef. 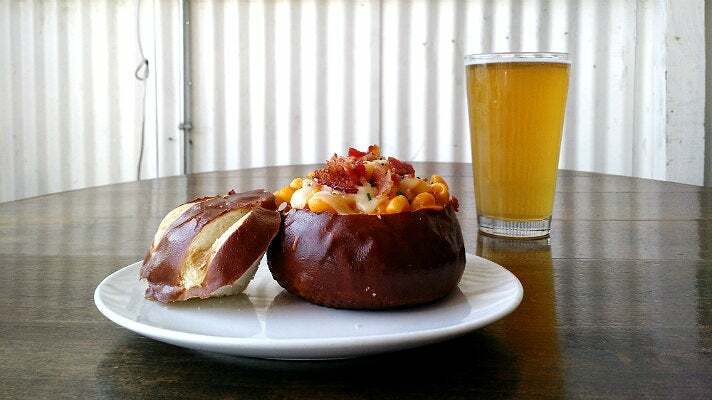 The menu includes pizza, salads, sandwiches and hearty entrees like bacon-wrapped meatloaf. This plate comes with mashed potatoes, crispy onion strings and Port wine sauce. If you have more time, keep in mind that Westwood Village has dozens of restaurants, though that would mean having to park twice. Ammo has become an entertainment industry hub in Hollywood, but clearly, Amy Sweeney has more culinary ammunition at her disposal. 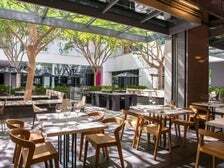 At The Armand Hammer Museum of Art and Cultural Center in Westwood, her courtyard café features stylish chairs, and roll up glass and steel doors that open to a planter-lined concrete patio with umbrella-shaded seating. 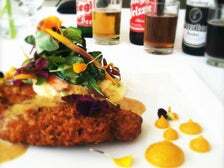 At lunch, which is the meal de resistance at the Hammer, Ammo at the Hammer primarily features sandwiches and salads. Enticing options include house-cured salmon to start, followed by a BLT or “famous” turkey meatloaf with whipped potatoes and sautéed kale. The Museum of Tolerance is a Beverlywood institution is designed to explore examples of racism and prejudice around the world, with a strong focus on the Holocaust. 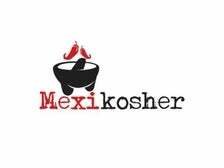 Located a mile east of the museum is Mexikosher, a unique Mexican Kosher restaurant from “Chopped” champion, Chef Katsuji Tanabe. 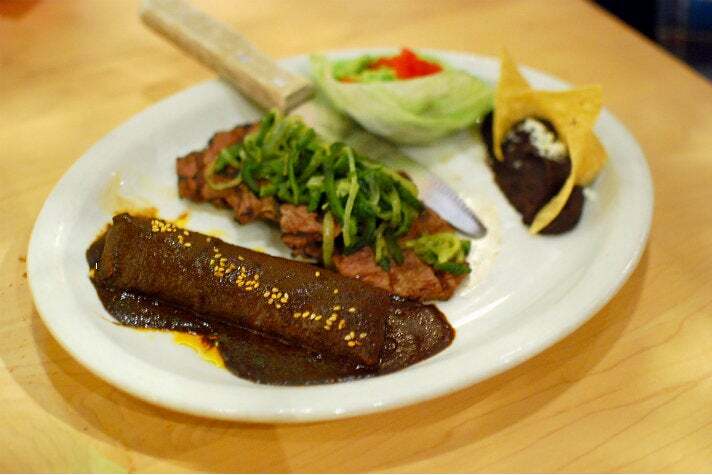 The Mexico City native crafts carnitas from slow-cooked beef and duck instead of traditional pork. Birria involves lamb and beef braised with a medley of dried chilies for 16 hours. Carne asada and Mayan-inspired chicken breast are two more options when constructing burritos, tacos, rice bowls, salad bowls or nachos. Creative house-made salsas include mango habanero, spicy peanut and Serrano aioli. The colorful space sports blackboard menus and tiny piñatas that may depict luchadores, burros, and possibly even Elmo. L.A.’s sister museum from the Getty Foundation resides on the Pacific Palisades bluffs, overlooking the Pacific Ocean. 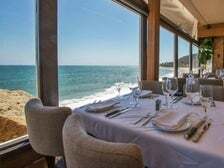 Located down Pacific Coast Highway, Mastro’s Ocean Club delivers luxury in a dining room with exposed wood beams and white clothed tables that overlook crashing waves. 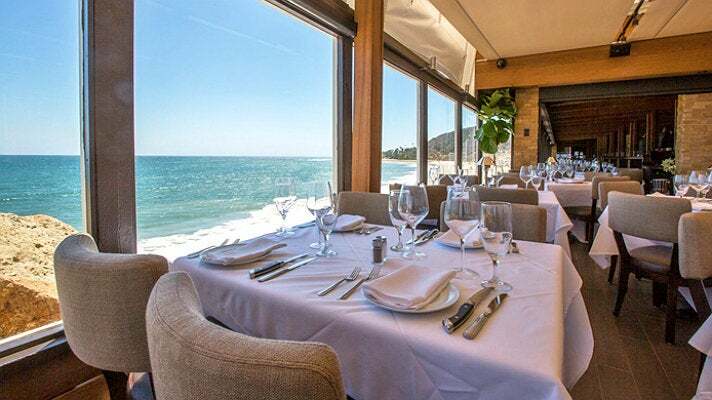 The Ocean Club has a slightly larger emphasis on seafood than the company’s Beverly Hills location. You can order a heaping seafood tower to start, seared albacore sushi with shaved black truffles, or a whole live Maine lobster that weighs six pounds. Still, nobody’s going to look at you funny if order a bone-in ribeye. The Huntington Library, Art Collections and Botanical Gardens is a bucolic, multi-environment garden and learning facility located a short jaunt from a strip of restaurants along Huntington Drive. Both the museum and the road are named for railroad and real estate magnate Henry Huntington, who was an avid art collector. San Marino Seafood is a market and café that dates to 2003 and houses sidewalk tables, educational posters devoted to edible ocean life and wall-mounted fish. 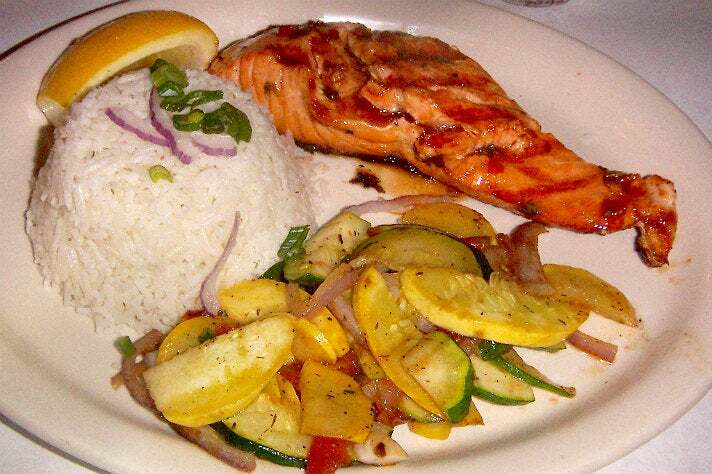 Warm up with a cocktail or smoked fish plate before diving into blue nose sea bass, breaded calamari steak or sautéed shrimp. The interactive Kidspace Children's Museum, with indoor and outdoor exhibits, resides at the foot of Rose Bowl Stadium, a short drive from Old Pasadena. 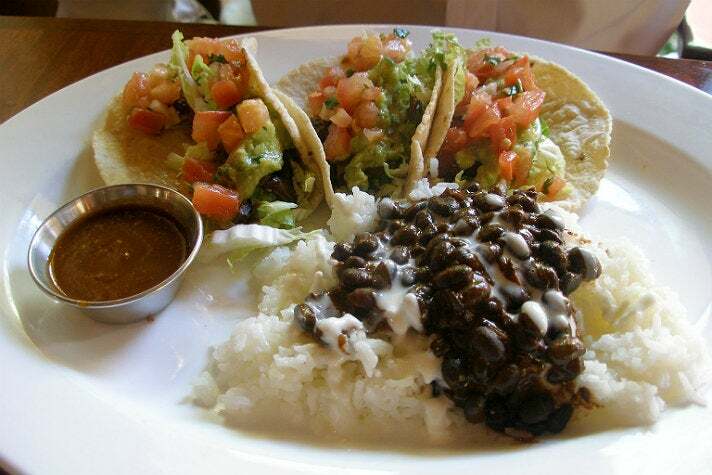 La Grande Orange Café is a nearby kid-friendly restaurant that’s housed in a historic building that once held the Santa Fe Railway station and now fronts a Gold Line stop. 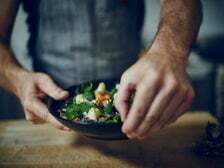 The menu is regional American, with highlights like rotisserie chicken or prime rib, a green chile burger, and a Brussels sprout salad with aged Manchego, dried berries and almonds. Pasadena is synonymous with Craftsman architecture, and Marston’s is a leading culinary representative. In 1987, Sally and Otis Marston opened the cottage for breakfast and lunch. 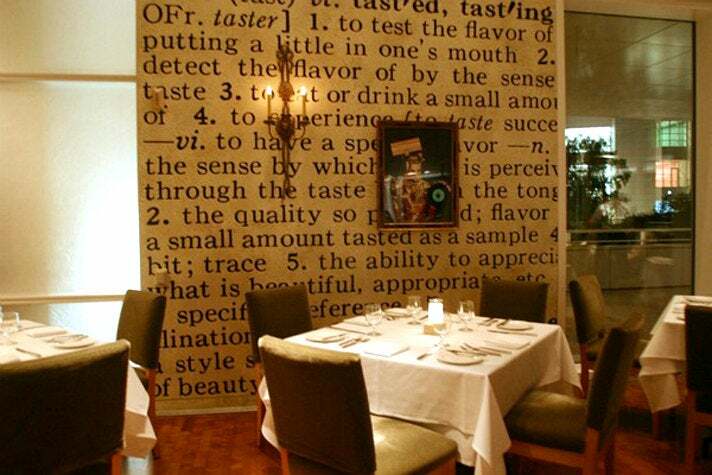 Since 2000, chef-owner Jim McCardy has shepherded the restaurant’s charming patio and art-filled walls. 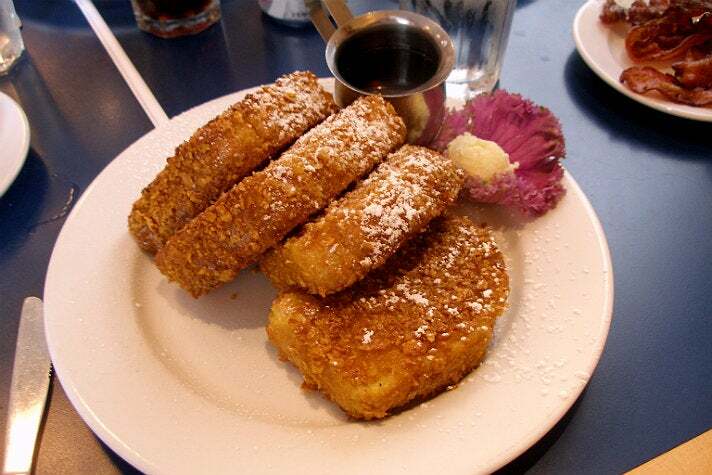 Cornflake-crusted French toast grew popular on bygone rail cars. The tradition continues at Marston’s, and said slabs pair exceptionally well with smoky grilled bacon. 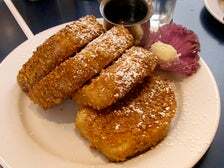 McCardy also features pancakes and omelets, plus Benedicts crafted with pulled pork and smoked salmon. Lunch brings sandwiches, salads and burgers. The hulking, heroic Battleship IOWA, which launched during World War II and was decommissioned in 1990, now provides a behind the scenes look into Navy life along the San Pedro waterfront. In nearby Ports O’ Call Village, the legendary San Pedro Fish Market can seat 2,000 people at a time, many of which come for the views of passing cruise ships and the Port of Los Angeles. 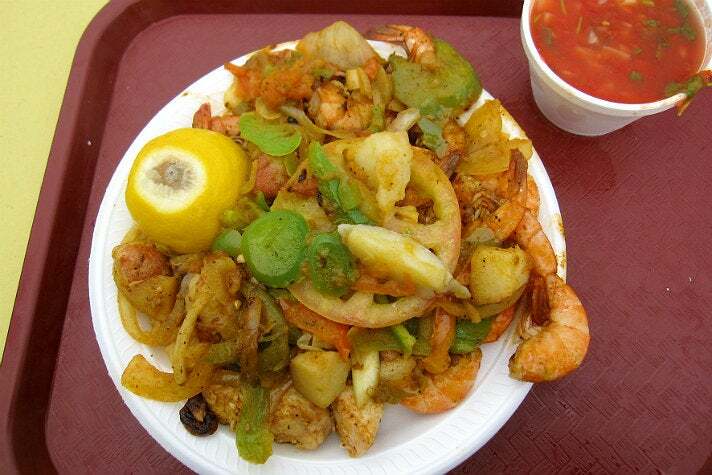 Trays of seafood fajitas star griddled shell-on shrimp, sea bass fillets and/or lobster, all lavished with grilled onions, green bell peppers, tomatoes and potatoes. A cocktail bar dispenses shrimp, oysters, ceviche, octopus, crab or scallops. Grab a mallet if you want to bust open crab, or return to the market to source shark fillets, tiny smelts or torpedo-shaped barracuda. Basically, they’ll cook anything that swims. The Museum of Latin American Art (MOLAA) resides in central Long Beach. Looking to amplify your Latin experience? 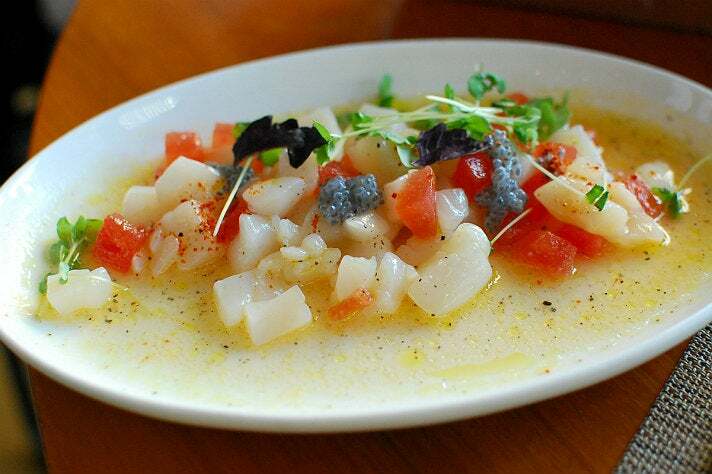 Consider Panxa Cocina, a restaurant from Chef Arthur Gonzalez in nearby Belmont Heights. The space features basket-like chandeliers, antler chandeliers and cream-colored banquettes. 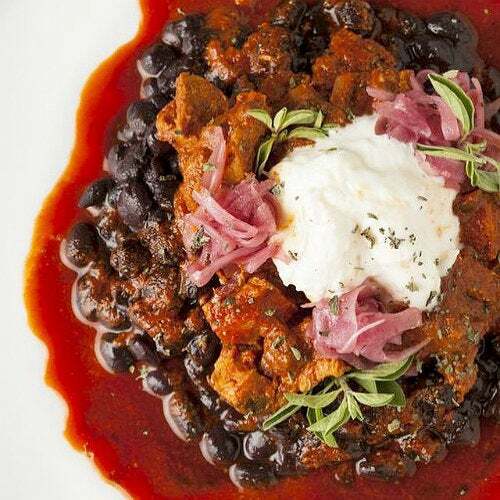 The menu is ostensibly Southwestern, with entrees like chile honey lamb shank, burrata and pork adovada, and Navajo tacos, but you’ll also find chips and guacamole, ceviche mixto, and charred queso Oaxaca with Hatch green chiles, cilantro pesto and tomato confit.